I got an email the other day from Tiana, PR Assistant in LAMuscle UK to review one of their product, slim gum. Truth is most of us will try anything just to lose weight and stay slim..true? 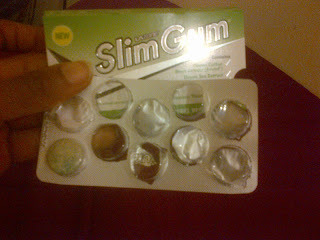 SlimGum a chewing gum enriched with proven weight-loss boosting ingredients available on the high street for just £2.99 and 10 pieces in a pack. I have never heard of slimgum. I occasionally chew gum to avoid over snacking but I stopped overtime. SlimGum claims to offers a discreet, convenient solution to weight management on the go and starts to work from the very first piece. It is specially formulated with a selection of key active ingredients shown to help reduce appetite and increase weight loss, SlimGum helps you to snack less and use your willpower more whilst limiting the damage of any fatty meals or over eating. It is sugarfree peppermint gum. Direction reads to take 1- 4 pieces of slimgum a day. You can take SlimGum when you feel hungry or weak-willed. Do not exceed recommended dosage. Help suppress your appetite in seconds and is said to be the worlds only patented chewing gum slimming aid. Several studies suggest that certain active ingredients are absorbed faster through simply chewing gum, rather than swallowing pills or capsules. Chewing gum has frequently been shown in studies to suppress appetite, hunger and the desire for snacks. I had one the first day and if you read my tweets, you’ll will notice I was’t hungry the entire day, I had to force myself to eat. This means slim gum does help curb appetite. Another thing i noticed was that the taste wasn’t too minty, it was nice and refreshing. I don’t think it will directly induce weight loss, it can indirectly help through the stopping of snacking and keeping your mouth busy and hunger at bay. If you struggle with over snacking then slim gum could be helpful. Slimgum isn’t a magic wand for weight loss, even the pack reads: May help weight management when combined with a healthy diet and regular exercise ….Meaning that there is not short cut to losing weight. Disclosure: I receive free product in order to evaluate and comment on my experiences on slimgum. * Please note: LA Muscle supplements are “Nutritional Supplements”. They are not medicines or drugs. They do not prevent, diagnose, restore, correct or modify any physiological condition or function in human beings. They will not treat diseases; they are not medicines. If you have a medical condition, please refer to your physician. If you get “any” side effects at all, stop use and refer to your doctor immediately. Never take more than the recommended dosage. Male hormone boosters are for people over 18 and mature for their age. If in doubt about anything at all, please contact LA Muscle.